UMF® 15+ refers to Manuka Honey’s unique anti-bacterial properties. These unique properties help support the body's immune system. Extremely good for upset stomachs and bowels. Most probably the most popular UMF® rating. 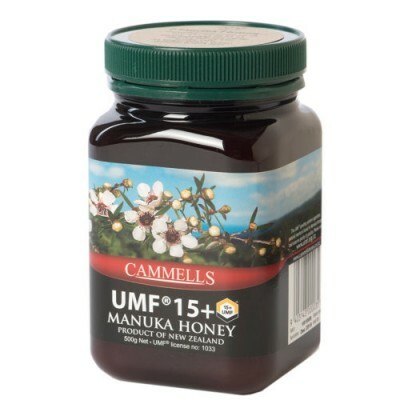 We sell more 15+ UMF-rated® Manuka Honey than any other and it's probably the most popular of all UMF® Manuka Honeys. UMF® Manuka Honey contains hydrogen peroxide plus its own natural antibacterial properties. It is this unique, additional activity that gives it the special antibacterial healing potency and UMF® 15+ Manuka Honey has very useful strength of therapeutic properties. Licence number 1033 - UMF® registered. Every batch of our UMF® Manuka Honey has been independently tested by a laboratory licensed by the UMF Honey Association who have calculated and certified its antibacterial strength. Every jar of our UMF® Honey carries its batch number and the testing laboratory's UMF® licence number. Only honey with a genuine UMF® rating of 10 or more is considered to be of therapeutic value and, if a jar simply that the honey has been tested to a strength of 15, 20 etc., it will most probably not contain honey that has reached that UMF® level. Similarly, if the jar just states that the honey is 'active' Manuka Honey, it will most likely not possess any UMF® rating at all. You can enjoy the unique flavour of Manuka Honey as an eating experience by itself straight from the spoon or you can spread it generously on to bread or toast as a tasty snack. Or add it to breakfast cereals or porridge - it's far better for you than sugar! It makes a wonderful soothing drink too when mixed with warm water. For relief from non-specific upsets of the digestive system such as indigestion and stomach upset, we recommend UMF® 10+ to 15+, for digestion disturbances that are more pronounced, such as gastric reflux, persistent indigestion, vomiting and diarrhoea we recommend UMF® 15+, and for strong, fast-acting antibacterial and healing action of gastritis and stomach ulcers a UMF® rating above 15 is best. For internal purposes, it is generally recommended to take 1 to 2 teaspoonsful, half to one hour before meals. However, it largely comes down to some self judgment on how much to take and how often: more often for an immediate issue, less often if it is not so severe. Note: Taking two spoonsful of UMF® 5+ is NOT the same as taking one spoonful of UMF® 10+. Our Manuka Honey, properly stored at room temperature will last for several years. It has no real expiry date. Any natural crystallisation can be corrected by warming. Honey and honey products must not be given to children under the age of 18 months. There are no reported problems of taking Manuka Honey during pregnancy. People with diabetes should check the suitability of manuka honey with their doctor or specialist. What is the difference between ‘Active’ and ‘UMF®’ Manuka Honey? Not all Manuka Honey has UMF® (non peroxide) activity and this is differentiated by using the terms ‘UMF® Manuka’ and ‘Active Manuka’ honey. UMF® (Unique Manuka Factor) Manuka Honey contains hydrogen peroxide plus its own natural antibacterial properties. This unique, additional activity gives it the special antibacterial healing potency. The minimum qualification for using the name UMF® and to be suitable for therapeutic use is a UMF® 10 rating. What does the UMF® rating mean? UMF is an abbreviation which stands for Unique Manuka Factor. UMF® is a phytochemically derived antibacterial property (i.e.. it is derived from the nectar of the flower) found in some types of Manuka Honey. Only honey collected from certain Leptospermum plants contain the special UMF® property. The UMF® activity exists in addition to the hydrogen peroxide antibacterial activity found in all honeys (this activity is due to an enzyme which is added to the nectar by the honeybee). These two antibacterial activities work synergistically - enhancing their effects. What is the difference between the UMF® ratings? Immediately after the letters UMF on a package of Manuka honey will be a number. This number increases up to 20. The UMF number is a standard way of describing the bacteria-killing power of the product. The honey is put in a plate with a bacterial culture, and the area is measured where the bacterial growth is stopped. this area is compared to a similar area produced by a solution of phenol and water. The number refers to the percentage of phenol in the water. So UMF 10 is honey that has the same bacteria-killing power as 10% phenol. In the same way that sunscreen provides higher levels of protection when the SPF value increases, a higher UMF rating indicates a stronger antibacterial strength of the Manuka Honey. Therefore, a ‘UMF® 20+ Manuka Honey’ will contain a higher level of guaranteed non-peroxide activity than an ‘Active 20 Manuka Honey’ which uses the combined total of peroxide and non-peroxide activities to generate the rating. UMF® 5 to UMF® 9 - maintenance level only (not recommended for therapeutic uses). UMF® 10 to UMF® 15 - useful therapeutic levels endorsed by the Honey Research Unit at The University of Waikato. UMF® 15+ and above - superior strength with high antibacterial levels. UMF® 20+ - superior strength with very high antibacterial levels.